Halloween was always my favorite holiday as a kid. It was the one time of the year when I could go out and get as much as I wanted. I just had to put in the work to get to as many doorsteps as time and distance allowed. I had two major costume themes growing up. The first was the classic Hobo. Back then it wasn’t in bad taste as we hadn’t invented homelessness yet. I went with the classic depression era tramp look, baggy coat, crumpled hat, smudged face, and the iconic kerchief on a stick bundle thingee. 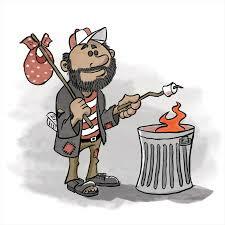 The rail-riding vagabond type I’d seen on the Red Skelton show, warming himself over a makeshift trashcan campfire, cooking beans in a can and roasting weenies on a stick. A rather romanticized ideal of life on the road. Not the mentally ill squalor of today’s homeless, but looking back, a need for freedom and escape, a yearning to be away from constraint and the tyranny of society. I’m sure a psychologist would have a field day analyzing my 12 year old psyche. Then came the Knight in Shining Armor phase. No doubt a shrink would see a misguided attempt at the hero role in the family, but for me it was a practical approach to self defense.